PATITUCCI TREE TRIMMING & REMOVAL, INC. | Serving Sacramento! We consider it a privilege and a token of trust to have been invited onto your property and entrusted to care for your trees. We will, at all times, honor that trust by respecting your property and enhancing the area in which we work. Our family has been in the real estate business for over 35 years. During that time, we have always called upon the Patituccis for the tree work at all of our properties. In fact, we use them at several locations, several times a year. They are very professional, thorough and a pleasure to deal with. I do not hesitate to recommend them highly. They are the best. For many years you have provided tree service for our property and this year was a banner year! We decided to have a tall (80'+) pine and five smaller trees removed. Mark and his crew were prompt as scheduled, informed neighbors, protected the property, and used very safe methods for removal. The stump chipping, and brush clean-up was no easy task. Nothing was left for us to do except say, "THANK YOU," and we will see you again. Just a short note to let you know how pleased I am with the work your crew did with the tree removal and trimming tasks performed earlier this week at my residence. The actual tree servicing was done with what I thought was a high level of skill and experience, as well as a regard for the other landscaping elements. In addition, the cleanup was thorough and well-executed. In short, a job very well done, in my opinion. Again, thank you for such a professional and well done job. 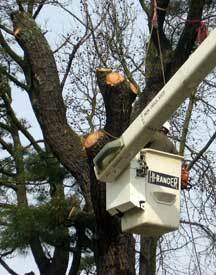 Patitucci Tree Service has done all my tree work on two properties since the year 2001. I have always been happy with the attention they have given my trees and the business like manner they have shown - from Lisa answering the phone (or calling me back promptly), to Mark's crew and his supervision. They have always worked in a professional manner – from the tree work, to the crew doing the final brush clean up – always a job well done! Outstanding service. Insured, workman's comp documents, friendly, careful, respectful. The team showed up on time, protected the walls of my newly painted house, protected my windows and French door, were careful with my neighbors' property and protected my shrubs under the trees. Mark, the owner, said that they are known for their clean-up; outstanding on that too. My neighbors were impressed – me too. Contact us for more information at (916) 944-3429 or (916) 261-9910.